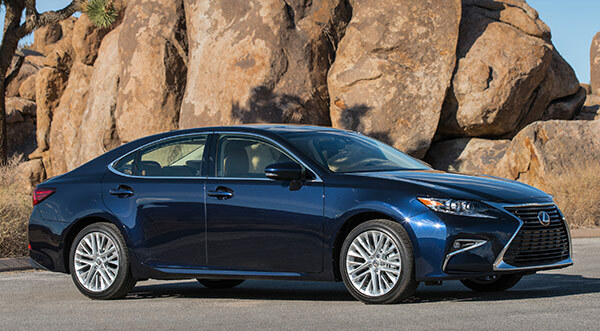 The polished, smooth and quiet Lexus ES is a midsize sedan on a full-sized wheelbase, designed that way to be a better family sedan with more room in the rear. For a family, it’s better than the smaller and tighter IS at the same price, and better than the GS sports sedan, both those Lexus models are rear-wheel drive. The ES 350 is designed for comfort, with a soft ride that isn’t floaty, and it uses front-wheel drive. It’s not that far mechanically removed from the Toyota Avalon, although it feels more sophisticated and refined. It was last redesigned for 2014, with its exterior touched-up for 2016; there are few changes for 2018, from 2017. It’s got a great and comfortable cabin, maybe best in class thanks to attention to detail; and it handles well, with nicely weighted steering. So there are a lot of positive things, despite its getting long in the tooth, in its fifth year of its sixth generation. The ES 350 uses a robust 3.5-liter V6 making 268 horsepower, mated to a six-speed automatic transmission. It’s a conservative, steady powertrain. There’s also an ES 300h hybrid, using a 2.5-liter Atkinson-cycle four-cylinder engine paired to an electric motor with generator. The Drive Select system offers Eco, Power and EV (all-electric) modes. The ES 350 gets an EPA-rated 21 City, 31 highway, 24 Combined miles per gallon; while the ES 300h rates 40 City, 39 Highway and 39 Combined mpg. The IIHS gives it five stars overall in crash protection, and four stars for frontal impact. But they still give it a Top Safety Pick+ award, probably because of standard automatic emergency braking. More standard safety equipment includes lane-keep assist, intelligent high beam headlamps, and adaptive cruise control. It comes with 10 airbags, including full-length curtain airbags and rear seat side airbags. A blind-spot monitor with rear cross-traffic alert is optional. The ES 350 and the ES 300h hybrid come in standard, Premier, and Ultra Luxury trim. The ES comes very well equipped. Standard equipment includes perforated NuLuxe leatherette upholstery, automatic climate control, keyless ignition, sunroof, HomeLink garage-door opener, 4.2-inch color info display, eight-speaker audio system with seven-inch screen, rearview camera, HD radio with traffic and weather data, Siri Eyes Free, Bluetooth streaming audio, USB/iPod connectivity, and satellite radio. The Ultra Luxury Package lives up to its name, with gorgeous semi-aniline leather seats and exotic wood choices like bamboo. Lexus Safety Connect adds telematic services including roadside assistance, emergency assistance, a stolen vehicle locator, and automatic collision notification. More options include a hard-drive-based navigation system with voice command, Mark Levinson audio, upgraded leather and trims (or NuLuxe seats that can be heated and ventilated), and the next generation of infotainment system with apps. The 2016 facelift brought the Lexus family’s big chrome spindle grille, aggressive front fascia and LED headlamps. The ES isn’t dull but it’s not cohesive either. The front end looks like it was added on, which it was. The signature spindle grille is distinctive but not beautiful and the chrome with so much area doesn’t enhance anything. The taillamps are L-shaped, and the tailpipes trapezoidal, one example of the lack of cohesion. The wide cabin has horizontal lines that bring elegance and airiness. The horizontal dash rides on a curvy instrument panel that wraps around the infotainment screen and optional navigation system with a visor, so sunlight doesn’t obscure the images. Most of the materials are rich, especially the available woods, although there’s too much matte-metallic trim, as standard. The very comfortable front and rear seats, upscale available materials, big infotainment screen, space efficiency, and interior silence set the standard for cabin quality in a midsize sedan. In writing that sentence, we just realized what a complimentary mouthful that is. One thing we don’t like is the way the optional Remote Touch works with its complicated and awkward controller. Instead of a knob or touchscreen, this mouse-like controller moves a cursor on the screen, which is annoying, and worse, distracting. There is a Back function that can undo the frequent misdirection on account of confusion in the myriad of menus. The ES comes standard with a 10-way power driver seat, while the available 12-way seat brings extendable lower cushions to support the thighs of long-legged drivers. In the rear there’s actual room for three adults. There’s a pass-through to the trunk, for things like skis. Because of its battery pack, the ES300h hybrid doesn’t have this pass-through to its trunk, and the trunk is a bit smaller. The hybrid is also a bit louder in the cabin, with its four-cylinder engine that’s raspier than the smooth V6 in the ES350. Otherwise the dampening of road and wind noise is stellar. There a couple of lapses, in audio and infotainment control. The Remote Touch mouse-like interface is awkward, as it moves a pointer on the display screen. And the lack of Android Auto and Apple CarPlay is surprising. The standard 3.5-liter V6 in the ES350 makes 268 horsepower, and is used in many Toyota models, which takes off some Lexus luster but not any performance; it delivers smooth and solid acceleration. The optional Drive Select system increases acceleration, but we found it to be just fine in Standard mode. The six-speed automatic works well, even being a couple of gears less than many rivals. The 2.5-liter four-cylinder in the ES 300h works with Toyota’s two-motor hybrid system to deliver surprisingly brisk acceleration and superb fuel mileage of 39 Combined miles per gallon, although not when driven so briskly. Its standard Drive Select system has Eco, Power, and EV modes. Eco is for fuel mileage, Sport quickens the car’s response, and EV enables the car to travel short distances at low speeds without gas. It’s mostly good for parking lots. Compared to other Lexus and Toyota hybrids, we could hear a bit more whine from the electrical components. But we think that’s only because the ES cabin is so well sound-proofed against other noises. That’s the Catch 22 that drives engineers crazy; the quieter you make a car, the more you hear lower decibel sounds you never heard before. Many luxury sedans nowadays have rides that are firm. The ES350, though not a luxury sedan, isn’t among them. The suspension is more athletic than might be expected, given the cushioned ride. The standard wheels are 17-inch alloys, although the models we’ve tested have had 18-inch wheels. That makes the tire sidewalls narrower, to keep overall diameter the same, and narrower sidewalls mean a firmer ride, but the ES350 doesn’t seem to feel the effects. The driving dynamics are relaxed, offering a breath of fresh air from a segment where many cars have become sportier than many buyers want. That’s where the GS comes in, for Lexus buyers. Still, the ES can feel politely athletic when it’s called upon to be, with steering that’s firm but not heavy. It tracks straight and predictably. The brake pedal on the ES 350 is much too spongy, without the firmness that’s necessary for confidence. The ES 300h has the same problem only different, with its regenerative braking system that recovers energy. The transition just isn’t smooth. The Lexus ES350 is a safe choice, with no surprises. It’s neither exciting nor especially stylish, but it has a solid powertrain, comfortable ride, decent handling, and impressive safety. Most of all, it has a superb cabin. The ES300h hybrid is a worthy contender in the near-luxury hybrid field, with snappy acceleration and stellar fuel mileage.